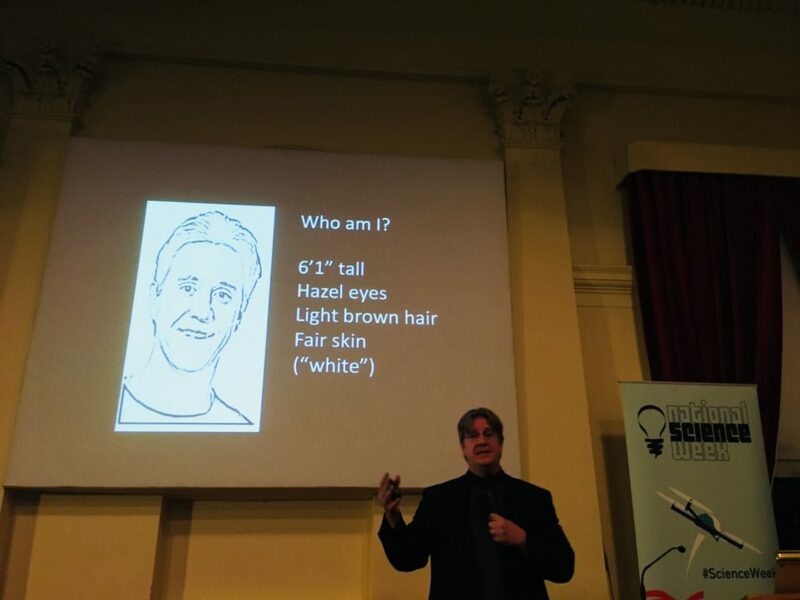 As Dr Larry Sherman stood up to present to the Royal Society of Victoria during National Science Week, the members of the audience made assumptions about him within a couple of microseconds. Our brains couldn’t help it. We saw Dr Sherman as a 6’1’’ tall man with brown hair, hazel eyes, and fair skin – but that’s not all that makes him who he is. We sometimes need a few seconds more to register that there is more to a person than meets the eye. As a Jewish male growing up in the affluent town of La Jolla, California, Dr Sherman’s experiences of racism and discrimination are most likely very different to mine – a Caucasian-Asian female who grew up in the very multicultural suburb of Footscray. When we get down to the psychology and neuroscience of prejudice, however, most people are the same. Initial impressions of Dr Larry Sherman. By the age of four, both ‘white’ children and children of colour display a skin colour bias in their perceptions; Margaret Beale Spencer presented children (African-American and Caucasian) that showed pictures of two people denoted only by colour, and when asked which of the two was the good boy or girl, 70-80% of children in both groups selected the ‘white’ images3. People often say that we are not born racist, however the truth is actually more complicated: new-born infants exhibit no preference for faces of various ethnic groups, however from the age of 3 months, infants begin to take longer to scan faces – indicating that they are thinking more about appearances – and exhibit a preference for faces of their parents’ (and own) ethnic group(s)4. These findings imply that while we may not be born racist, our perceptions of ethnic differences are learned during early development as a result of exposure to own- versus other-race faces. We also teach children to avoid the topic of ethnic differences as though it is taboo to mention that other people have different coloured skin. Rather than telling children that the reason some people have a darker skin tone is due to their greater levels of melanin pigment, they are often told not to ask about it. Dr Sherman hypothesises that it is perhaps during this very early stage of development that it is critical to introduce the idea of racial differences in an open way, because no matter how much children are covered in “bubble wrap”, they will inevitably be exposed to people who look different to them. When this happens, it’s important that stereotypes aren’t associated with them (such as those that pervade the media) because those can “sink into [a child’s] brain”. Human behaviour and reactions can easily be conditioned, as shown by John Watson and Rosalie Rayner’s Little Albert experiment1: Albert was continually brought a white rat, and while he was initially curious and played with the rat, Watson and Rayner hit a steel bar with a hammer every time they brought it out, which would startle him and make him cry. Over time, Albert began to cry as soon as he saw the white rat being brought towards him, even without the noise, and this fear extended to other white, furry animals. While there have been numerous criticisms of this study, including investigating the health status and identity of “Albert”, it has left a lasting impression in the field of psychology. We perceive people who are not like us as ‘outer’ and can even fear them – and fear is a powerful driver of thinking and behaviour. Major and her colleagues demonstrated that learned fear extends to racial prejudice by performing several experiments in which people of different races gave either positive or negative feedback to each other, or played a word game similar to Boggle; when more prejudiced individuals played with a partner of the same ethnicity, they viewed it as a challenge, however when competing against or receiving feedback from someone of a different race, it was more often perceived as a threat5, thus a basic interaction is altered by the initial recognition of a face. I admit to prejudicial fear as a child: I was injured in kindergarten by a girl of a darker skin tone, and when I next came across another girl of a similar, darker skin tone in grade three, I was automatically apprehensive and kept a distance. While I never said anything to my new classmate, I told my mother on the first night of grade three, who explained to me that we shouldn’t group people of the same ethnicity together. The girl and I are still friends to this day and I’ve welcomed people of various ethnicities into my life since – it goes to show that we can undo the conditioning of our brains. A survey led by Western Sydney University revealed that 51.4% of respondents claimed to express anti-Middle Eastern sentiment and 43.9% with anti-African sentiment2. Furthermore, individuals of a Language Other Than English (LOTE) or Aboriginal and Torres Strait Islander background reported the highest rates of racism and discrimination in public, at work, or in educational institutions. While a survey of 6000 people may not be the most convincing sample size for a study, the numbers are still staggering and serve as a reminder that racism is a potent societal issue. I may have overcome it personally, but racism remains tenaciously embedded in our society. In order to understand the neural basis for prejudice, we have to take a closer look at the brain. Functional MRI can be used to map areas of the brain that are activated during facial recognition. Within milliseconds of seeing a face, people can take in the visual cues of race, gender, and approximate age. When European American males were shown flashes of unfamiliar, Caucasian faces as part of a Stanford University psychology and radiology study, the first area of the brain to be activated was the fusiform gyrus, which is involved in facial recognition6. When they were shown faces of people of colour on the other hand, the fusiform gyrus response was delayed, and the first area of the brain to respond was the amygdala, responsible for the fight or flight response. The amygdala response was annulled, however, if the person of colour’s face was that of a well-known person or a few character details were provide prior to the experiment. There may have been something behind Dr Sherman’s mother’s comments to him when he was young, that “[African-Americans] all look the same to [her]”: when we are unfamiliar with people of different ethnicities, the amygdala initially groups them together as a possible threat, rather than the fusiform gyrus recognising their individual faces. Functional MRI was used in additional studies to determine whether racial variation also modulates the empathic neural responses of the anterior cingulate cortex, which mediates pain and empathy for others’ pain. These studies revealed that only pain applied to members of the same race of an individual stimulated the empathic neural response, and decreased for other racial groups7, but when members from other racial groups are considered as part of that individual’s social group or team (e.g. sports team), the empathic response returned8. This distinction between recognising the familiar versus unfamiliar has downstream physiological consequences due to the release of cortisol when our go-to response is fear. When both victims of racism and racists themselves hold a fear of one another, their fight or flight response is constant – and while it’s beneficial to have this response in low doses, it is harmful when continuous. Chronic high levels of cortisol as a result of discrimination lead to weight gain, sleep deprivation, hostility, hypertension, a weakened immune system, and other negative health effects9. Individuals with higher perceived stress and internalised racism tend to have behavioural disengagement and cortisol dysregulation, putting them at greater risk of metabolic abnormalities10. Dr Sherman observed that the leading causes of death among African-Americans – heart disease, cancer, stroke, etc. – are all ailments that can be exacerbated by chronic cortisol elevation, and hypothesised that there may be a role of racism in driving this11. High levels of cortisol also induce death of neural stem cells, particularly effecting the hippocampus, which is involved in learning and memory, and therefore can be linked to decreased learning and memory capabilities as well as depression. With so many detrimental effects to physical and emotional health, it is therefore unsurprising that Dr Sherman classifies racism not just as a social problem, but also as a “public health problem”. 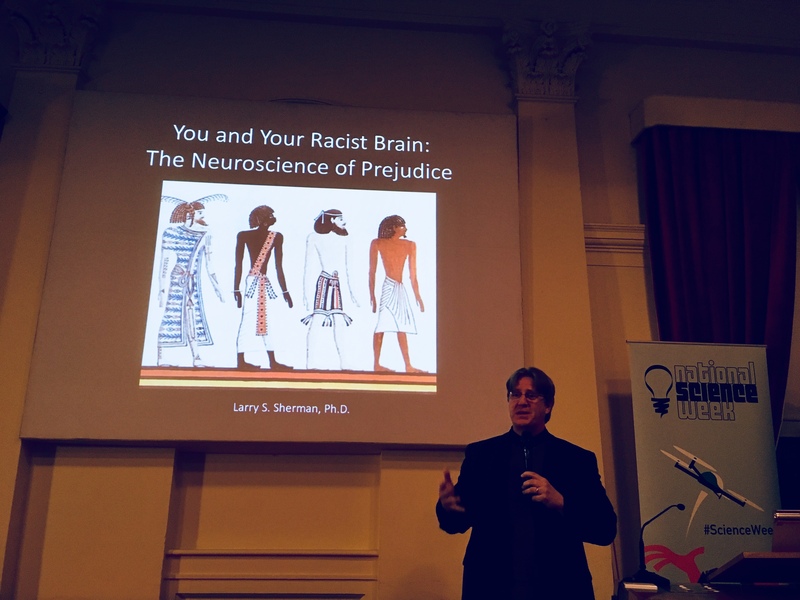 Dr Larry Sherman explores the neuroscience behind racism. The effects of stress and high cortisol (and indirectly, racism) can also be passed down through generations via epigenetic modifications of genes, as though ‘we leave traces of our social history in our offspring’. DNA is constructed of individual base nucleotides (A, G, T and C), that together provide the code for our cells to build molecules. Epigenetic modifications include adding or removing a methyl group to a specific site of DNA, such that it acts as a physical blockade on the DNA sequence to make it more difficult to be read while the DNA sequence remains unaltered. With three billion nucleotide (pairs) in each cell, DNA is supercoiled around a series of histone proteins in order to compact it – similar to winding an old telephone cord around each of your fingers. Histone proteins can also undergo epigenetic modifications to alter the accessibility of certain genes where genes wrapped tightly around the histones are hidden and the strands in between each histone are more readable. Genes that are methylated or around histones are inaccessible by the transcription machinery that reads DNA to transcribe it into functional molecules. The epigenetic effects of chronic high cortisol levels can therefore switch genes on and off – which genes are affected is still being investigated, but it is clear that racism and trauma not only have an impact on us during our lifetime, but also on our descendants, with clear intergenerational effects. While it remains difficult to disentangle the exact relationship between parental trauma and downstream epigenetic effects, there was a correlation of epigenetic changes to a stress-related gene that is associated with post-traumatic stress disorder (PTSD) and depression: Holocaust survivors have greater methylation of this gene compared to study control groups of Jewish parents, whereas Holocaust survivor’s offspring had lower methylation compared to control offspring – perhaps children of Holocaust survivors inherited traits that promote resilience12. Dr Sherman generously shared his family history and own experiences of persecution as someone from a Jewish heritage. His grandfather was the only one of nine siblings who escaped anti-Jewish pogroms, and his grandmother lived in Austria, where her family were killed in the concentration camps of the Holocaust; his grandparents were some of the few of his ancestral lineage to make it out of Europe alive. During Dr Sherman’s life, the only time being Jewish has given him considerable grief was on the playground in primary school, when he was beaten up after informing another child that he didn’t go to a church, but to a synagogue, but he is unsure of whether he has personally inherited epigenetic modifications to his DNA as a result of ancestral persecution. His story made me wonder what epigenetic changes may have been made to my own DNA from my parents’ histories. My mother was persecuted during the Fall of Saigon for being the daughter of a capitalist. She was among the wave of Vietnamese refugees that arrived in Australia in the late 1970s, after spending time in a refugee camp in Malaysia. The traces of her high cortisol levels while being victimised as a refugee may therefore have been inherited in my epigenome. 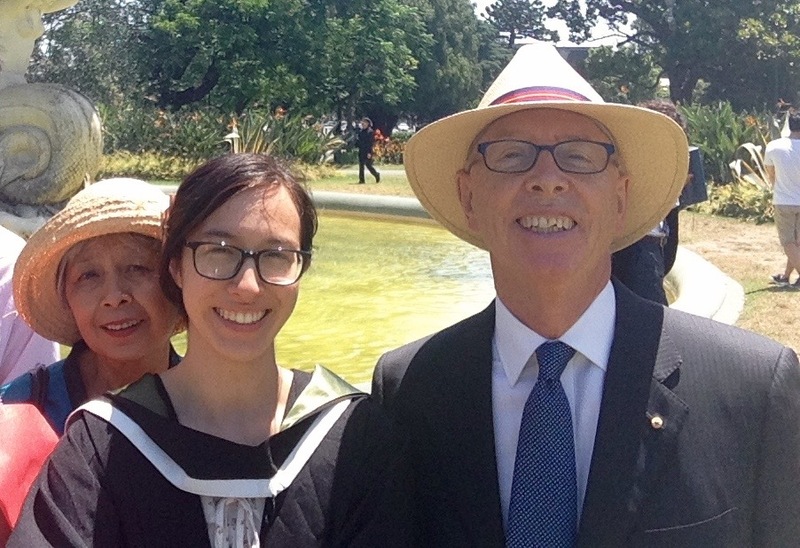 I’m fortunate in that I myself have never been a victim of racist behaviour – in fact, not many people realise that I’m part Vietnamese until they see my surname – although, growing up in the multicultural suburb of Footscray, I wouldn’t have been out of place either way. Sometimes I feel slightly isolated among the Vietnamese Community of Australia (VCA), as I can’t speak Vietnamese well (I often hear that “[my] Vietnamese is so funny”) and I’m usually the token Caucasian asked to dress up in a traditional ao dai and sing the Australian national anthem to open their formal events, which may go back to Dr Sherman’s idea that groups who have had to adapt to being a minority, such as the Vietnamese community in Australia, can occasionally be less welcoming of people from the dominant ‘inner’ group due. Perhaps it’s because of this that I’ve often felt a little out of place among the Vietnamese growing up, however, the more VCA events I attend, the more I become a familiar face and they accept me a lot more. 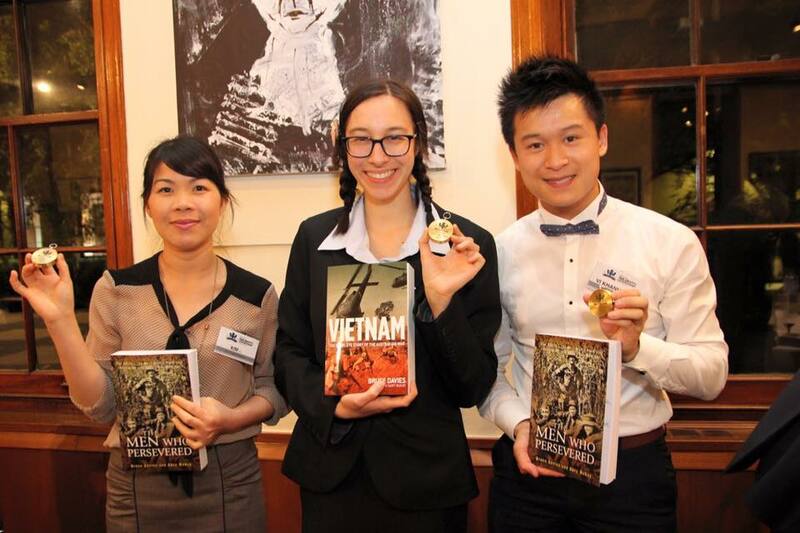 Graduation of the Dual-Identity Leadership Program participants, run by the Vietnamese Community of Australia, 2015. While he is not a social scientist, Dr Sherman offered words of wisdom on how we can embrace racial identity without prejudice. It’s important to him that we are ‘not colour blind’ – especially given that our brains seem to make that practically impossible – but that we should be accepting of the fact that we all have different experiences and points of view. It’s interesting that when children are asked to described themselves, Caucasians will never say that they are Caucasian, rather, they are ‘normal’, while people of a different, minority ethnicity will use that as a self-descriptor. With growing awareness of racism and privilege, there begins to be a redefining of self and our core values. Dr Sherman referred to the stages of achieving racial identity described by William Cross and Janet Helms; we pay little attention to racial identity and then as we become more aware of our differences, we should not only band together in our respective ‘groups’, but also immerse ourselves in each other’s culture and experience. Dr Sherman believes that we should be advocates for each other and work as a team to share our voices and experiences, because otherwise we will remain as ‘insiders vs outsiders’, and ‘majority versus minorities’. Given that neuroscience suggests that dealing with race is an issue of familiarity, he recommends getting to know our neighbours. In speaking to police officers, he encouraged them to bring back local, neighbourhood officers, who enjoy a friendly sport game with the people, hence reducing apprehension and unfamiliarity on both sides. We all have innate responses to faces – we naturally form opinions and notice particular characteristics about people – but the way we respond to faces is a learned behaviour. As someone who has family from both Scotland and Vietnam, interacts with people from a myriad of backgrounds (Footscray is as diverse as a Melbourne city gets), and have good friends who came out as transgender or gay, I lack prejudicial thoughts towards any particular group, which goes to show that perhaps it is familiarity that is the key to minimising racist attitudes and behaviour. 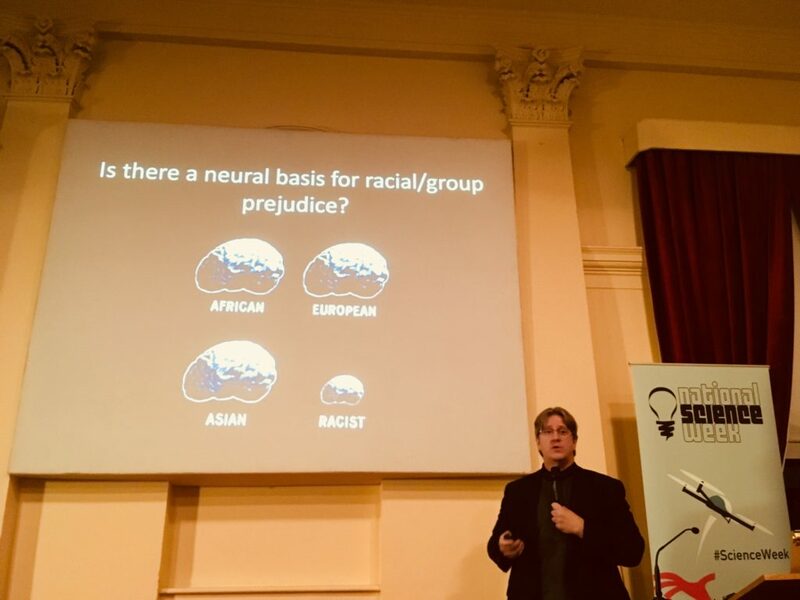 While I may only be one person and not reflective of the entire population, my story, in amongst the overwhelming evidence discussed by Dr Sherman, suggests that if we can rewire the brain to see people in the same way, we may be able to do something about racism. The good news is that the public health effects and social effects of racism and racist behaviour are reversible: epigenetic modifications to DNA can be reversed, neural stem cells can recover from high levels of cortisol if it is removed, and it is possible to create new neurons (neurogenesis) and re-wire circuits in the brain13. A neural pathway is created when certain thoughts and behaviours are repeated often enough, hence it is possible to undo negative, racist behaviours and attitudes. We physiologically become more receptive to the unfamiliar once it becomes familiar to us and we no longer see people who are different to us as threats, and therefore perhaps it is a matter of getting to know the people around you and the people who may not look like you. Racism is a social and health problem for everyone involved – the racists and victims of racism – so it’s time that we try to understand the basis of prejudice and racist attitudes and did something about it, because the neuroscience shows that it’s certainly possible. Written by Catriona Vi Nguyen-Robertson and edited by Mike Flattley. Watson, J.B. & Rayner, R. Conditioned emotional reactions. Journal of experimental psychology 3, 1 (1920). Kathleen Blair, K.D., AlannaKamp, Oishee Alam. Challenging Racism Project 2015-16 National Survey Report. Penrith, N.S.W., Australia: Western Sydney University; 2017. Spencer, M.B. Personal and group identity of Black children: An alternative synthesis. Genetic Psychology Monographs 106, 59-84 (1982). Kelly, D.J. et al. Three-month-olds, but not newborns, prefer own-race faces. Developmental science 8, F31-F36 (2005). Golby, A.J., Gabrieli, J.D., Chiao, J.Y. & Eberhardt, J.L. Differential responses in the fusiform region to same-race and other-race faces. Nat Neurosci 4, 845-850 (2001). Xu, X., Zuo, X., Wang, X. & Han, S. Do you feel my pain? Racial group membership modulates empathic neural responses. J Neurosci 29, 8525-8529 (2009). Sheng, F. & Han, S. Manipulations of cognitive strategies and intergroup relationships reduce the racial bias in empathic neural responses. Neuroimage 61, 786-797 (2012). Findling, J.W. & Young, J.W.F. Cushing’s Syndrome. The Journal of Clinical Endocrinology & Metabolism 90, E2-E2 (2005). Tull, E.S., Sheu, Y.T., Butler, C. & Cornelious, K. Relationships between perceived stress, coping behavior and cortisol secretion in women with high and low levels of internalized racism. J Natl Med Assoc 97, 206-212 (2005). Leading Causes of Death in Males, 2015 (current listing): Centres for Disease Control and Prevention; 2015. Yehuda, R. et al. Holocaust Exposure Induced Intergenerational Effects on FKBP5 Methylation. Biological Psychiatry 80, 372-380 (2016). Adlaf, E.W. et al. Adult-born neurons modify excitatory synaptic transmission to existing neurons. Elife 6 (2017). next post: National Science Week grants for 2019 – applications now open!